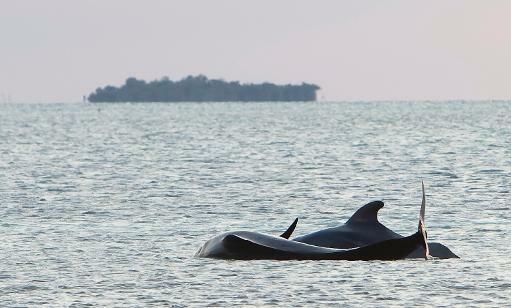 Two stranded pilot whales struggle in shallow waters near Cudjoe Key, Florida on May 5, 2011. Miami (AFP) – Florida rescuers are racing to save more than 40 whales stranded in shallow water after 10 others from the pod died, a US official said Wednesday. The pilot whales are located in a very remote region of Everglades National Park in the southern part of the state, according to the National Oceanic and Atmospheric Administration. NOAA spokeswoman Blair Mase told reporters that four of the whales had to be euthanized and six others had already died. “The area is so shallow that it’s difficult to get the whales enough water to propel them back to sea,” she said in describing a “very challenging scenario” for rescuers. It was still unclear why the whales — currently numbering around 41 — became stranded in the water, which is less than three feet (0.9 meters) deep. “The whales are known to inhabit deep water so they are very out of their home range,” Mase said. Rescuers were working together with four animal protection groups and asked for specialists from other countries for advice. Linda Friar, a spokeswoman for Everglades National Park, told local media that rangers received a call on Tuesday with word that four whales were stranded. But when teams arrived on the scene, they discovered a much larger number. Everglades National Park provides a unique habitat for a range of species, including crocodiles.